Admit it. You hate leftovers. So do I, usually, except when they can be rehashed into something wonderful. 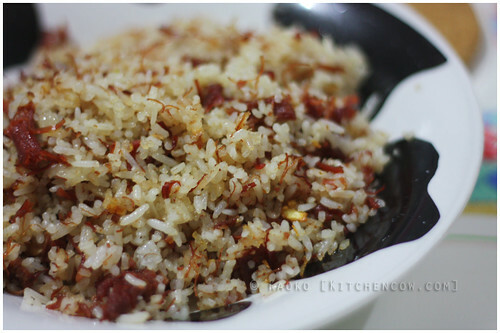 One such leftover revamp I enjoy is corned beef fried rice. It’s not so different from the classic Pinoy quick fix meal of corned beef and rice, but the extra step of turning it into fried rice creates an interesting texture that makes you forget that it’s practically the same thing as what you had the night before. I usually start off with a few tablespoons of corned beef — the almost dry kind you get when you just sauté the canned stuff with garlic and onions, no water added. The last time I did this, I used leftover Ranch-style Delimondo, so it was nice and stringy. In a hot, heavy saucepan, I reheat the corned beef to melt the solidified fat and to grease the pan. Then, I transfer everything to a separate dish. If there’s enough fat to fry my rice, perhaps a tablespoon for two cups of rice, I throw 3-5 cloves worth of finely minced garlic in. If the corned beef fat is less, I add a bit more oil. Olive, when I pretend to be health-conscious. Once the garlic sizzles and starts changing color to a wonderful, dark beige, I throw my rice in. Cold, leftover rice is best for sauteing. For best results, I run a wooden spatula through the rice beforehand, making sure that the grains are separated instead of being just a big hunk of cold rice. Hunks are usually good, except if we’re talking cold rice for cooking fried rice. At this point, the scent of frying garlic usually gets to everyone in the house, and I hear the patter of tiny puppy feet. It’s tough but if this happens to you, do your best to ignore the beggy, puppy eyes at your feet. There is usually not enough to go around, so remind yourself that people food is not advisable for puppies and he’s better off ignored. Once the rice is mostly done, I make a well in the center then dump the reheated corned beef in. Slowly work the corned beef into the rice, distributing evenly. The rice will absorb any leftover corned beef juices, giving you a dry, fried rice with loose, flavorful grains mixed in with partially crisp threads of meat. Switch your fire to low, then leave it to cook according your fried rice preferences, stirring occasionally so it doesn’t burn. Cooking longer gives you a drier, stiffer bite. Dump everything in a bowl. Grab a spoon. Rush to your bed and put your favorite DVD on. Happiness is leftover corned beef and rice. OMG. WHY DID I NOT THINK OF JAPANESE MAYO? Guh, I hate you.